Engineering major, Garrett Johnson, puts in some time on the treadmill in the cardio area of the Wellness Center during intersession. Students enrolled in OCCC classes for summer or fall semester can use the Wellness Center weight room, cardio area and basketball courts with proper ID. The OCCC Wellness Center has expanded its opportunities to students and future students this summer by offering classes and equipment to those who are enrolled for the summer or who are enrolled in classes for the fall. 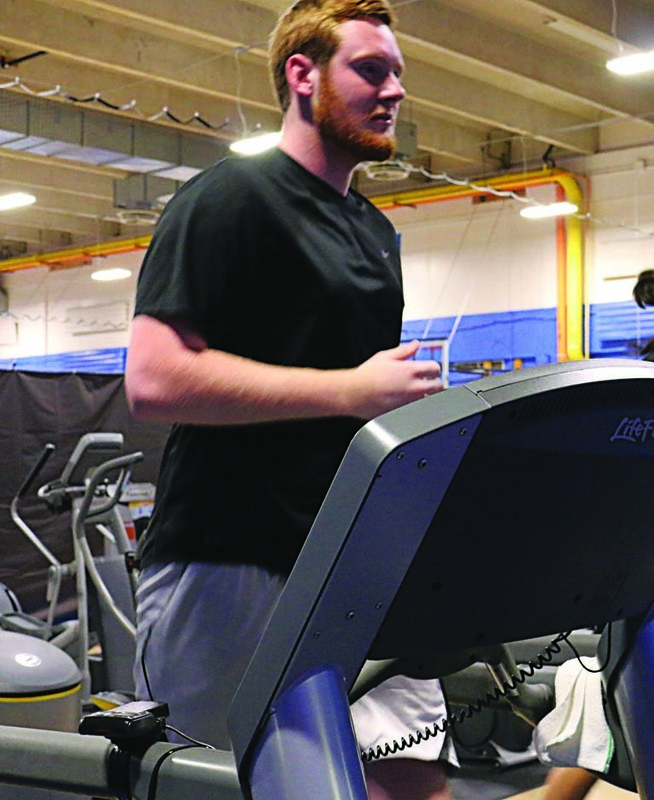 Wellness Center staff said students don’t have to be enrolled this summer to use the gym, as long as they are scheduled to take classes this fall. The basketball courts will be closed during the morning and early afternoons, while the Recreational Summer Camps for kids (ages 6-12) are in full swing. College students are still able to attend classes, use the weights and utilize the cardio area equipment. Students must present student ID to check in at the Wellness Center desk. The class offerings include TRX, Zumba, Cardio Kickboxing, Cross Train, Theatrical Dance, and Taekwondo. According to Wellness Center Director Brooke Dresel, a brand new class will be introduced this semester. Instead of Sets and Reps being on Mondays and Wednesdays, Tabata Cycle will be offered on Mondays. Tabata is high-intensity cycling using specialized stationary bikes. Sets and Reps will remain on Wednesdays, Dresel said. The basketball courts, badminton and volleyball areas won’t be closed the entire summer, though. Recreation Specialist Matthew Wright said they may be open periodically while, the children (at the camps) are having lunch from noon-1 p.m. The courts reopen for college students from 6:30-8:30 p.m. Wright said. Campus is closed entirely on Saturdays and Sundays this summer however. Students wanting to participate in intramurals won’t find any this summer. They have been canceled temporarily due to decreased student enrollment and lack of sign-ups. For more information about the summer schedule at the Wellness Center, students can stay up to date at occc.edu/rf, or by calling the office at 405-682-7860.